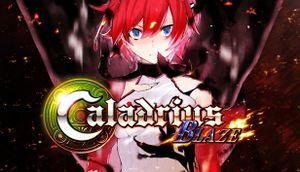 Updated version of Caladrius with new content, integrated DLC, and restored missing voice-overs from the Xbox 360 version. Lock at 720p with limited video settings whereas the PlayStation 4 version runs at 1080p, and keyboard support is limited. Steam version will not launch in Offline Mode. Does not work with Steam in offline mode. The GOG.com and Steam versions have separate leaderboards. Resolution is locked at 1280x720 while the game screen is 960x720. Toggled from the Options menu as Screen Mode settings under Screen settings. 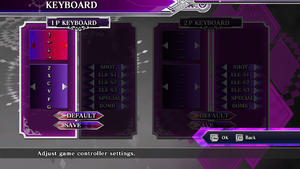 Limited remapping support; only features a few presets of usable keys or disabling them entirely during gameplay. Xbox 360 prompts are shown when Player 1 is using a controller. 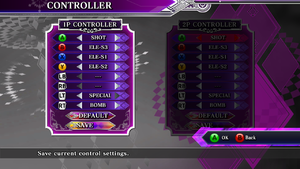 It allows DirectInput controllers, but only on 2P side, does not allow use of menus with it and the button configuration still shows xinput buttons. You can however start the game as 2P only. Only accepts input from whichever device presses Start on the title screen for Player 1, with the other device being assigned for Player 2. Voice-overs during gameplay are not captioned. 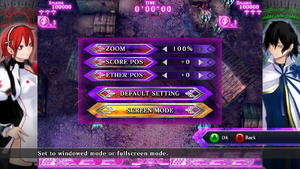 Set Play Mode to Dual when starting a game to play co-op with two players. ↑ 1.0 1.1 File/folder structure within this directory reflects the path(s) listed for Windows and/or Steam game data (use Wine regedit to access Windows registry paths). Games with Steam Cloud support may store data in ~/.steam/steam/userdata/<user-id>/386770/ in addition to or instead of this directory. The app ID (386770) may differ in some cases. Treat backslashes as forward slashes. See the glossary page for details.